(MENAFN - Gulf Times) Aspire Zone Foundation's (AZF) significant role in Qatar's historic win at the recently-held 2019 AFC Asian Cup has helped elevate further Aspire Zone's status as a major sports hub and destination. 'This year, we can clearly see the wisdom of the nation's leaders in dedicating a national day for sport. February is now linked to sport victories after the amazing achievement of our national football team, which was of course led by Aspire academy graduates. The Qatari team has been making headlines across the world, which indicates that the efforts of everyone at Aspire Zone have now paid off. 'This success is not only related to its sate of the art facilities at Aspire but it is also due to the expertise of its staff who've invested a lot in building the current generation of Qatari champions. I expect that this generation will change the face of sport in Qatar and Asia, said AZF CEO Mohamed Khalifa al-Suwaidi. Highlighting the series of Aspire's sports activities on Tuesday was the presence of His Highness the Amir Sheikh Tamim bin Hamad al-Thani at the event. 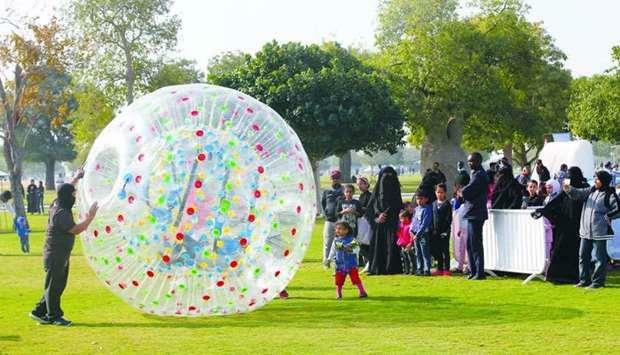 More than 30,000 people, many of which are families, joined AZF's National Sport Day (NSD) celebrations on Tuesday. Families and children were treated to 30 sporting events Aspire's world-class venues, such as the outdoor Football Pitch 10, Aspire Dome, and Aspire Park. Aspire Logistics director general Abdulla Nasser al-Naemi kick-started Aspire's NSD celebration with the fun run. Joining him was al-Suwaidi and hundreds of running enthusiasts who conquered the 3km course around Khalifa International Stadium. The fun run was followed by a 2km-walk around Aspire's lake led by AZF president Hilal bin Jaham al-Kuwari, who was joined by al-Suwaidi, al-Naemi, Deputy Director General of the Academy Ali Salem Afifa, and Aspetar acting CEO Abdelaziz al-Kuwari. Al-Naemi said the 'good organisation, variety of activities, and dedication of Aspire's logistical and human resources was the result of hundreds of hours of planning and preparation to organise its 2019 NSD event 'in a way that reflects the place of Aspire Zone at the heart the community. Al-Kuwari said, 'Aspetar's staff work behind the scene to help sport stars perform at their best and allow them to unlock their potential. We are not only providing support to world-beating athletes, we are also raising people's awareness about health. There is no better day than the national sport day to raise the awareness of our community, he said. AZF NSD Organising Committee chairman Nasser Abdullah al-Hajiri added: 'Aspire Zone can fulfil one of its strategic objectives in line with Qatar National Vision 2030, which is to modernise the country and transform it into a sustainable society capable of providing the highest standards of living for its citizens by building generations of physically and psychologically healthy people.